To analyse the implementation, applicability and accuracy of the pretest probability calculation provided by NICE clinical guideline 95 for decision making about imaging in patients with chest pain of recent onset. The definitions for pretest probability calculation in the original Duke clinical score and the NICE guideline were compared. We also calculated the agreement and disagreement in pretest probability and the resulting imaging and management groups based on individual patient data from the Collaborative Meta-Analysis of Cardiac CT (CoMe-CCT). 4,673 individual patient data from the CoMe-CCT Consortium were analysed. Major differences in definitions in the Duke clinical score and NICE guideline were found for the predictors age and number of risk factors. Pretest probability calculation using guideline criteria was only possible for 30.8 % (1,439/4,673) of patients despite availability of all required data due to ambiguity in guideline definitions for risk factors and age groups. Agreement regarding patient management groups was found in only 70 % (366/523) of patients in whom pretest probability calculation was possible according to both models. Our results suggest that pretest probability calculation for clinical decision making about cardiac imaging as implemented in the NICE clinical guideline for patients has relevant limitations. • Duke clinical score is not implemented correctly in NICE guideline 95. • Pretest probability assessment in NICE guideline 95 is impossible for most patients. • Improved clinical decision making requires accurate pretest probability calculation. • These refinements are essential for appropriate use of cardiac CT. The original version of this article was revised: The names of the authors Philipp A. Kaufmann, Ronny Ralf Buechel and Bernhard A. Herzog were presented incorrectly. The online version of this article ( https://doi.org/10.1007/s00330-018-5322-5) contains supplementary material, which is available to authorized users. A correction to this article is available online at https://doi.org/10.1007/s00330-018-5521-0. The authors of this manuscript state that the CoMe-CCT project received funding from the joint program of the German Research Foundation (DFG) and the German Federal Ministry of Education and Research (BMBF) for meta-analyses. The scientific guarantor of this publication is Marc Dewey. All authors have completed the Unified Competing Interest form at www.icmje.org/disclosure.pdf (available on request from the corresponding author) and declare: RR, VW, PG, WBM, MG, HA, LH, NB, EZ, SL, BG, CR, AAS, BN, AS, MFLM, HB, SMMJ, KAØ, ACPD, AH, BAH, VMR, YLW, JR, MS, CL, SG, EM, HN, AS, KN, GU, ZZ, HM, MC, DAH, DB, RJ, KS, LY, TJ, JPL, RM, SM, JCT, DM, AdR and ML have nothing to disclose. GMS reports grants from German Federal Ministry of Education and Research (BMBF), during the conduct of the study. DA reports other from GE Healthcare, during the conduct of the study; other from GE Healthcare, outside the submitted work. GP reports other from General Electric, other from Bayer, other from Medtronic, other from Heartflow, outside the submitted work. JH reports grants from Siemens Medical Solutions, outside the submitted work. UJS reports grants from Bayer, grants from Bracco, grants from GE, grants from Medrad, grants from Siemens Healthcare, outside the submitted work. JK reports personal fees from Lantheus Inc, grants from Orion Pharma, outside the submitted work. KN reports non-financial support from Siemens Medical Solutions, grants from GE Healthcare, other from Toshiba Medical Systems, non-financial support from Abbott Vascular, grants from Bayer healthcare, outside the submitted work. PK, RRB, and BH report that the University Hospital Zurich holds a research contract with GE Healthcare. JL reports personal fees from GE Healthcare, personal fees from Heartflow, outside the submitted work. BC reports research grants from GE healthcare and educational support from TeraRecon, outside the submitted work. NP reports grants from Toshiba Medical System, outside the submitted work. JH reports grants and personal fees from Toshiba Medical Systems, during the conduct of the study. RH reports grants from Toshiba, outside the submitted work. PS reports grants from Ministry of Education and Research (BMBF) for meta-analyses as part of the joint programme "clinical trials" of the BMBF and the German Science Foundation (DFG), during the conduct of the study; grants from German Science Foundation (DFG), grants from European Union, outside the submitted work. MD has received grant support from the Heisenberg Program of the DFG for a professorship (DE 1361/14-1), the FP7 Program of the European Commission for the randomized multicentre DISCHARGE trial (603266-2, HEALTH-2012.2.4.-2), the European Regional Development Fund (20072013 2/05, 20072013 2/48), the German Heart Foundation/German Foundation of Heart Research (F/23/08, F/27/10), the Joint Program from the German Research Foundation (DFG) and the German Federal Ministry of Education and Research (BMBF) for meta-analyses (01KG1013, 01KG1110, 01KG1110), GE Healthcare, Bracco, Guerbet, and Toshiba Medical Systems. MD has also received lecture fees from Toshiba Medical Systems, Guerbet, Cardiac MR Academy Berlin, and Bayer (Schering-Berlex). MD is a consultant to Guerbet and one of the principal investigators of multicentre studies (CORE-64 and 320) on coronary CT angiography sponsored by Toshiba Medical Systems. He is also the editor of Coronary CT Angiography and Cardiac CT, both published by Springer, and offers hands-on workshops on cardiovascular imaging (www.ct-kurs.de). 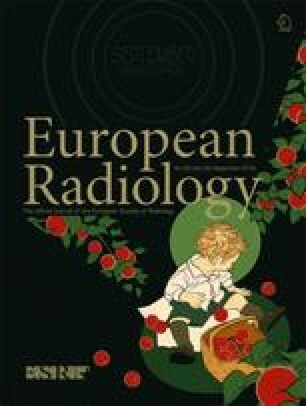 MD is an associate editor of Radiology and European Radiology. Institutional master research agreements exist with Siemens Medical Solutions, Philips Medical Systems, and Toshiba Medical Systems. The terms of these arrangements are managed by the legal department of Charité – Universitätsmedizin Berlin. Written informed consent was not required for this study because of the retrospective study design (meta-analysis). Institutional Review Board approval was not required because of the retrospective study design (meta-analysis).